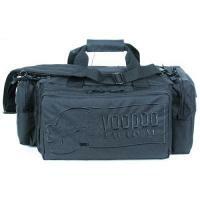 Carry everything needed for a day at the range in one bag with the Voodoo Tactical Rhino Range Bag. Designed to be an all-in-one carry bag, the Rhino utilizes a tactical layout to ensure ultimate gear organization. A double zipper top access panel unzips to expose an easily removed inner bag for quick deployment of shooting essentials. Ideal for organizing frequently used shooting accessories, adjustable dividers, magazine loops and a drawstring dump pouch provide quick and convenient access to bag contents without the bulk of the full range bag. The primary bag contains an organized pocket system ideal for secure storage of firearms and other range accessories. A full-size padded front pocket provides room for larger firearms, while the divided rear pocket allows for scratch-free carry of multiple pistols. Side pouches offer even more storage with outer zipper pockets to hold additional loose ends. A versatile design offers a removable padded shoulder strap and double-stitched hook-n-loop handles for both over the shoulder and free-hand carry. Rubber feet give this bag a sturdy base, ensuring it will not slide about or dirty the shell. Dimensions (L x W x H): 22" x 15" x 11"